The High-Ride Quick, Click & Carry Holster was designed at the request of our customers. Our customers loved the comfort and convenience of the Original Quick, Click & Carry however desired more of a shooters grip when wearing jeans/belts. The High-Ride Quick, Click & Carry is our direct response to your request. 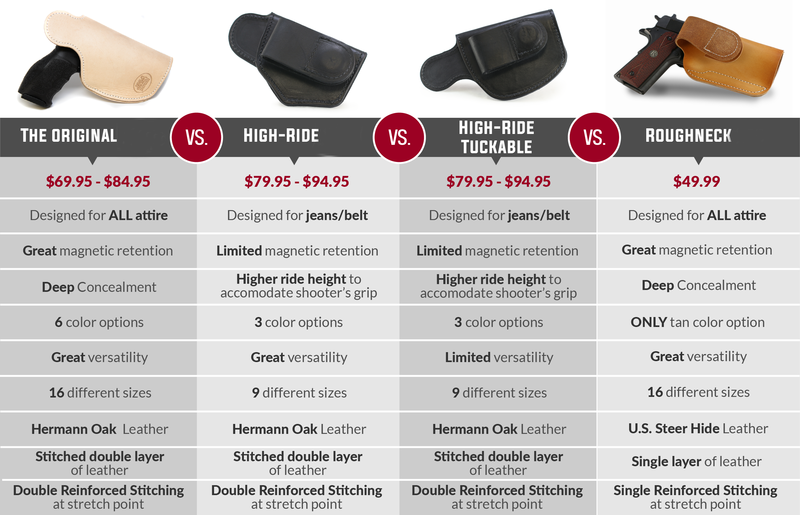 Designed more for jeans and belts the High-Ride Quick, Click & Carry allows you to be armed and prepared without the hassle of clips that damage your clothing. The High-Ride does have magnetic retention but it has been reduced due to the placement of the magnets to acquire the higher ride of this holster. However the magnetic pull force remains the same as the Original Quick, Click & Carry holster when evaluating the attachment to the waistline. You still have the same versatility as the Original Quick, Click & Carry. Made with Hermann Oak Grade A Vegetable Tanned Steer Hide that's Ph balanced for gun contact, you will never need to worry about the damage to the bluing of your firearm. The black and brown holsters do start as Hermann Oak Grade A Vegetable Tanned Steer Hide and are hand dyed with high grade dyes. To keep the comfort of the soft leather we do not apply a sealant to the black or brown holsters and they do have the possibility of slight bleeding onto skin or clothing the first couple times of use but will wash out. Due to the additional supplies and labor that goes into to achieving the different colored holsters, these are priced at $15 more than the basic tan. With the exception of the original large ALL of our Quick, Click & Carry holsters come standard with a sweat guard. These are more pronounced with the sizes above the large. Please refer to generated image once you have selected your size, color (if applicable), and hand. The image will be the specified item you are purchasing. Please visit our sizing page to determine what size will be best for your firearm.